Mayor Dabbs volunteers to be tased during citizen training. Scroll down for the video. Thursday night at the Bryant Citizens Police Academy, several people volunteered to be tased as part of the “Use of Force” segment. There were six class participants that agreed to step up to the challenge – one of them was Mayor Jill Dabbs. 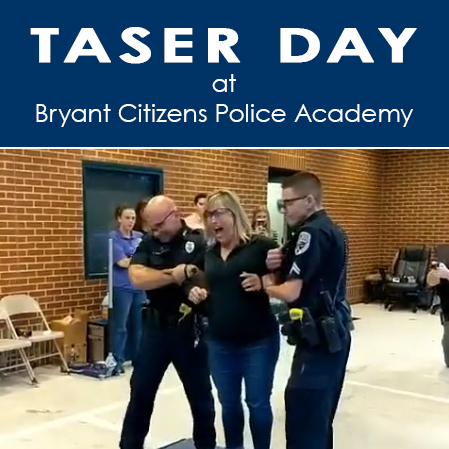 Bryant Police Department went live on Facebook as each volunteer was hit with the Taser darts. The Mayor called it “riding the lightning” when she told MySaline about this event earlier in the day. Reports are that is what it feels like to be tased. Among questions asked in the Facebook video comments, people wanted to know “Why would you put yourself through this?” Mayor Dabbs gave her own answer about her experience and what it meant to her. Sgt. Crowson said, “With 6 sessions left, we look forward to providing new challenges and more education to what it is like to wear the badge.” For more information regarding the Bryant Police Department Citizens Academy, please contact Sgt. Todd Crowson.